I’m finally joining in on this trend of having a monthly wrap-up. Why? Well I like summaries of stuff, and I’d like to share little real-life tidbits in a post like this as well. Let me know what you think though, if this is a feature worth adding. In June, I read a total of 11 books and posted 9 reviews & 5 discussions. After going through a reading slump with review copies that were disappointment after disappointment, I’m glad to say I have finally recovered, and I discovered a new gem that now holds a place on my all-time favorites shelf. It’s been a pretty good month for me! 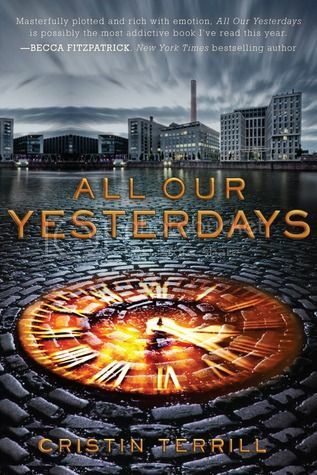 Of course, I loved All Our Yesterdays, but I can’t post that review until September 6th. But apart from that, I had 5 reads between 4 and 5 oranges! However, since I just finished Arclight today, that review won’t post until next week. Guacamole. I just cannot get enough of the stuff lately. Star Trek Into Darkness. Because Benedict Cumberbatch. Downton Abbey! Finally watching it! Classical music, because I’m cool like that. This month I added a Facebook page for the blog, so you can follow me over there and be updated about all the blog posts. I started the new discussion feature, The Keys to My Heart, to give me an outlet to talk about all the bookish elements that I love. I’m currently looking for a co-blogger or guest reviewer, so if you’re interested, check out the application form. I got an internship!!! And pretty much the perfect one, doing exactly what I found most interesting during my studies at the company I want to work for. So starting July 10th, I will be working full-time for a year. How this will affect blog activity remains to be seen. My mother moved back to the Netherlands for good, so I’m no longer halfway around the world from both parents! I guess that’s kind of cool. I finished my master courses (actually I did that at the end of May, but okay) and have a GPA right now of 8.3. Now, I just have to finish my thesis, but since I have to remain a student for the whole duration of my internship, I’ll be graduating in September 2014. My uncle celebrated his 50th birthday and 45 years of music last weekend by putting on a concert. He’s an amateur pianist, but a damn good one. I love classical music and the concert was amazing. People were crying. It was just beautiful. And it’s put me in a total classical music mood, so now I’m listening to Rachmaninoff non-stop. As you’ve probably heard, Google Reader is dying, and GFC is likely not far behind. So don’t forget to follow Snuggly Oranges elsewhere, so you don’t miss out on this…. inane babble… stuff… This month, I added a Facebook page, so don’t forget to like the blog over there! You can also use the sidebar widget to follow via e-mail. How was your month? What were your favorite reads? Which of my posts did you like the best? Did I miss any interesting posts over at your blog? Did anything interesting happen in real life?